Ever since I discovered Lush shampoos a couple of years back, I have almost completely ignored other brands. Which is okay, since Lush does make some awesome products, but for longest time, there was no shampoo that was quite right for my colored hair. I Love Juicy, Curly Wurly, Trichomania, Cynthia Sylvia Stout - I use and love them all - but they really aren't the best for colored hair, especially when it's freshly colored and more prone to fading. There are lots of sulfate-free shampoos even at drugstores, but everything I have tried so far just leaves my hair dull and not feeling all that very clean. 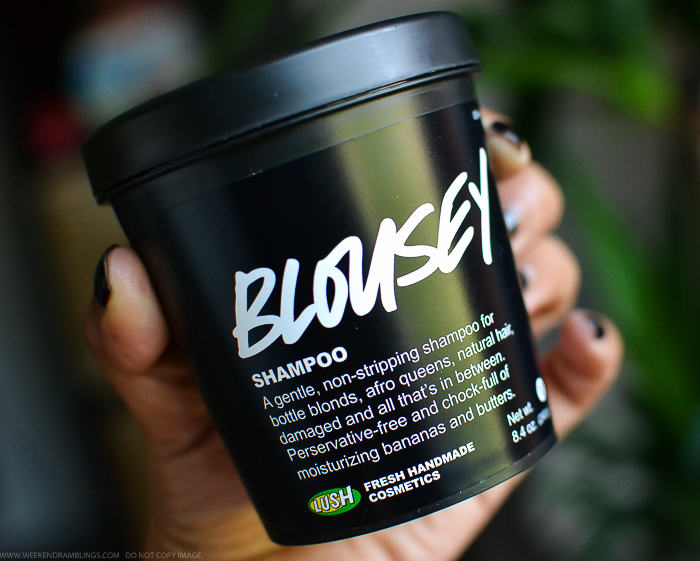 Which is why I was quite excited when Lush came out with Blousey - a moisturizing shampoo recommended for colored hair. Scroll on for more photos and review. 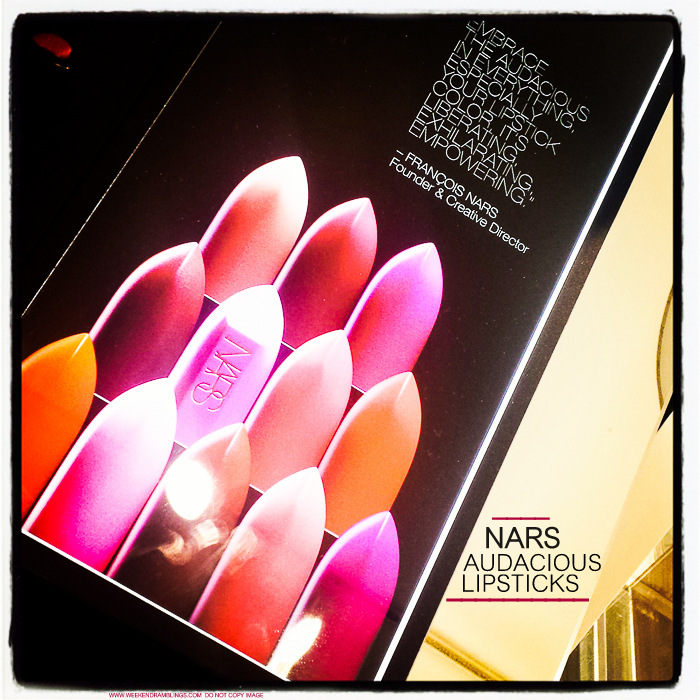 NARS Audacious lipsticks are a newer addition to their existing line of lipsticks. 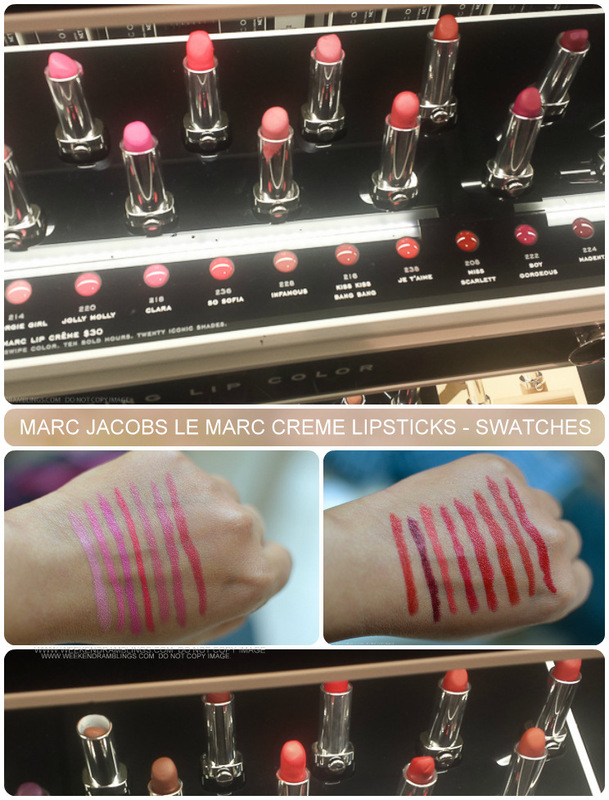 From what I can tell with swatching these at counters, the Audacious lipsticks certainly live up to their name, These go on creamy smooth, are richly pigmented, and seem quite longlasting too. I don't any of these yet - mostly because I am trying to use up my existing stockpile of makeup - but I definitely have my eye on at least one or two of these shades. For now, here's a look at some swatches. 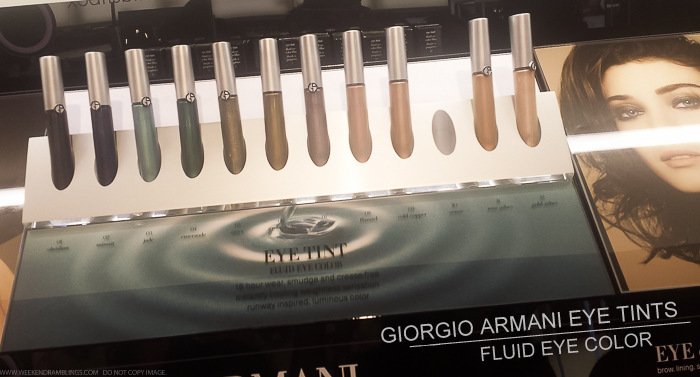 Giorgio Armani Eye Tint - a long-lasting, tinted formula with the comfort and smoothness of a cream for intense, vibrant eye looks. The liquid to solid formula provides 16 hours of smudge- and crease-proof wear and can be used as an eye shadow or eyeliner, to create looks that range from natural to glamorous. The packaging is similar to that of most liquid eyeliners or glosses, and the applicator is a flocked wand (similar to that seen with most lipglosses). Here's a look at the swatches. 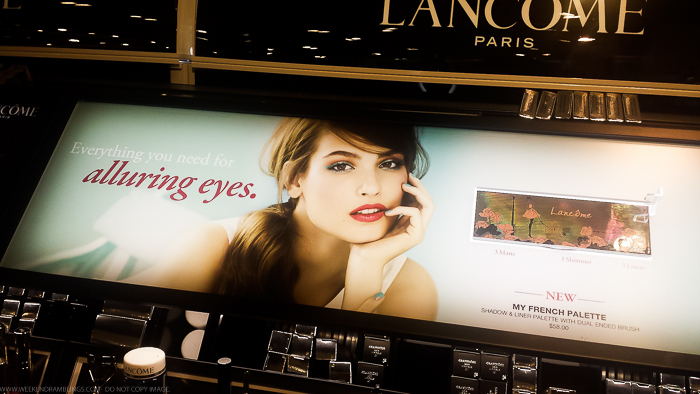 Part of Lancôme's Spring 2015 collection, the limited edition My French Palette is inspired by the atmosphere of a Parisian garden in the Spring. 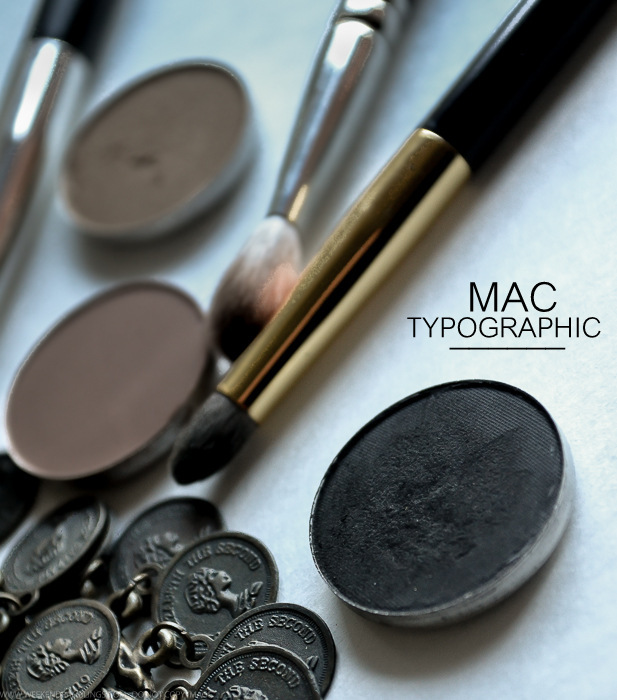 The palette contains a harmony of matte and iridescent pinks, ideal for fresh and refined smoky looks. 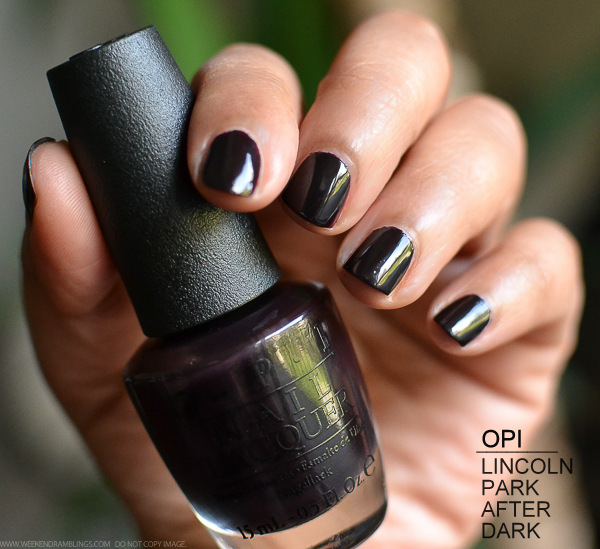 The color can be used on their own for simple romantic looks or blended and layered together to create more sophisticated looks. The sleek packaging has a lovely Parisian garden motif over the cover that adds to the spring romance theme of the palette. I couldn't really do justice to the pretty packaging because of the really lousy in-store lighting, but scroll on for more photos and swatches. 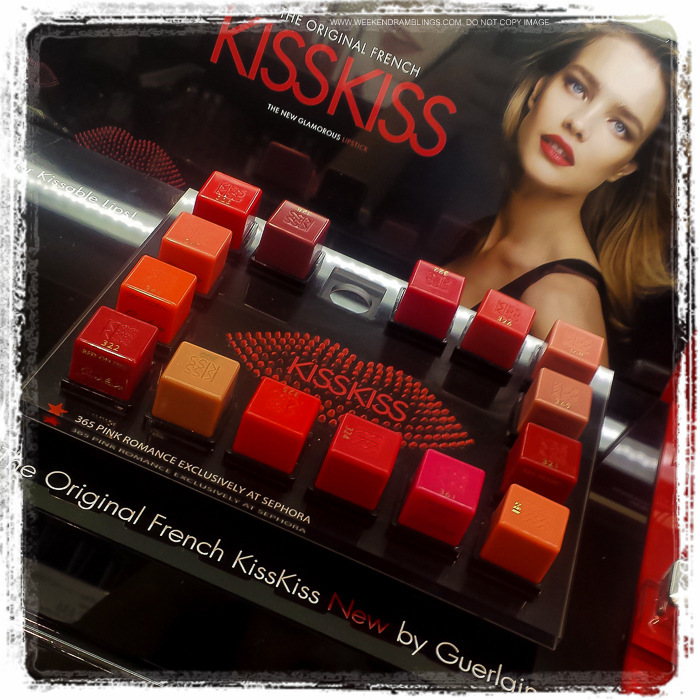 Guerlain KissKiss lipsticks were re-launched a while back, but I got around to swatching these only recently. These lipsticks are enriched with hydrating mango butter and hyaluronic acid spheres to plump lips and have a satiny, vibrant finish. 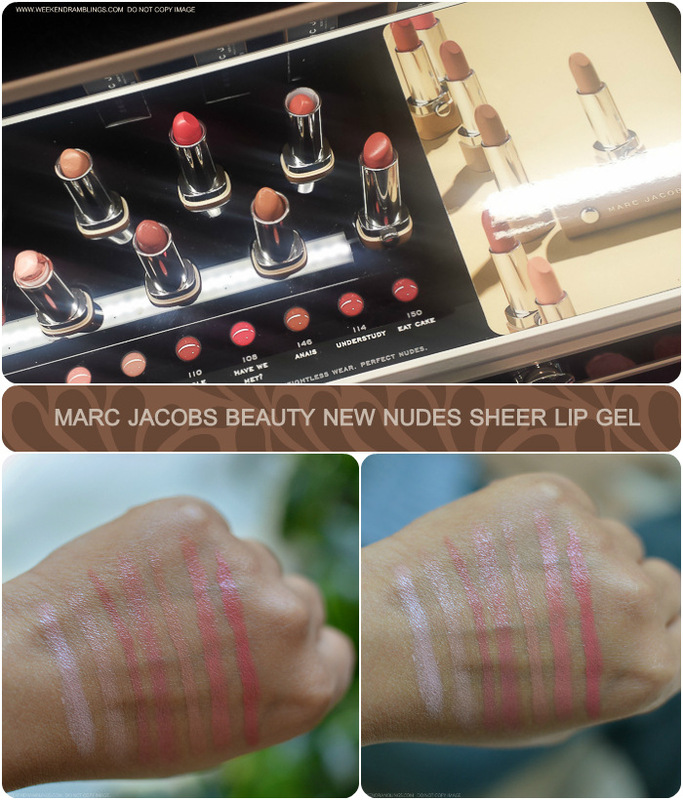 They are slightly on the sheer side (some shades more than others) but definitely go on creamy and smooth - perfect if you are on the lookout for more moisturizing lipsticks. Here's a look at the swatches. 1. EOS Summer Fruit Lip Balm: 95% organic, 100% natural, and paraben and petrolatum free. Has a fruity-sweet taste and smell. Scores high on the cuteness factor and is great to carry around in the pocket/bag. About $3 at Walmart. 2. Bubble Farm Soap Co. Soothing Beeswax Salve (Unscented): Has an extremely short ingredients list - Olive oil, beeswax, and organic Calendula officinalis flower extract. Is a solid balm but scoops out easily with finger pressure. Melts into the skin with massaging though it takes a bit of time for the greasiness to absorb completely. Perfect if you want something more heavy duty for hands, feet, elbows. I picked this up from Whole Foods for $10, but this is available online from the Bubble Farm Soap Co. Store and shipping is FREE on everything. 3. 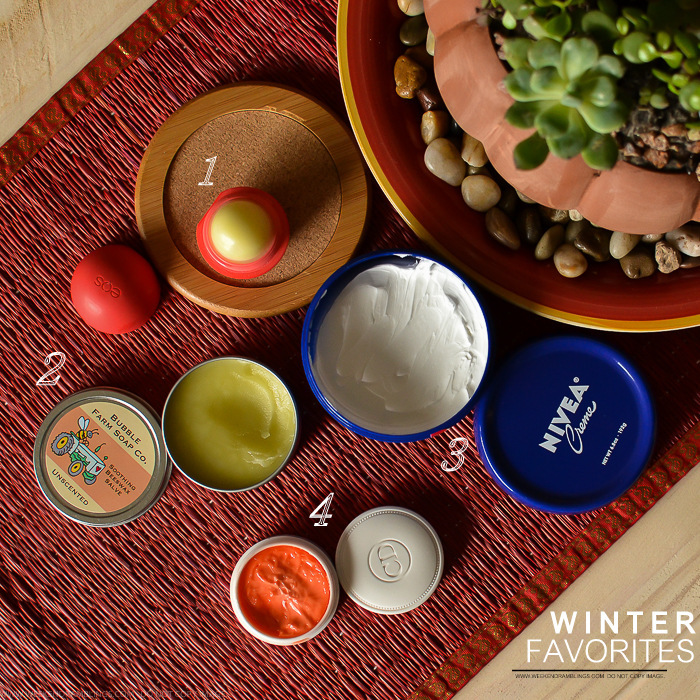 Nivea Creme: This is a winter must-have for my dry skin. It's a bit difficult to work into the skin and can be a bit too greasy, so using this as an all-over body cream is reserved for days when I have loads of time and an awful lot of patience, but it does leave my skin feeling "nourished." I mostly use this as a night-time foot moisturizer. Easily available almost everywhere and costs about $6 (saw a whole lot of these in the clearance section at my local Target for around $3). Links provided in the post are NOT affiliate/sponsored links and are provided for information only. Comments have been closed on posts. Please use the "contact me" option for any queries.